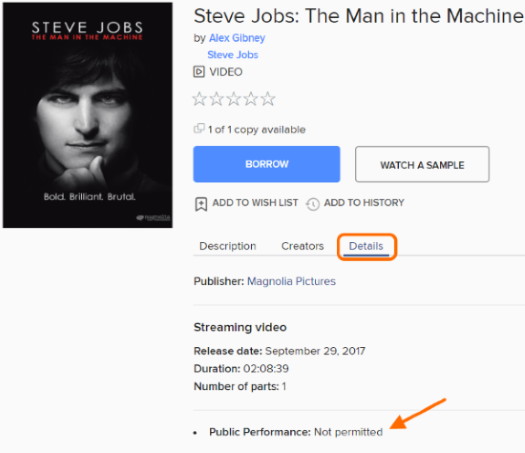 Some videos have extra permissions (digital rights) that are set by the publisher. These permissions determine how you can watch the video once you borrow it. You can view a video's permissions from its details page by opening the Details tab. Expires: Once you start watching this video, it will expire from your library account after a set amount of time (like 48 hours), even if there are extra days left in your lending period. Public performance: The publisher does (or does not) allow this video to be played in a public setting (like a classroom or public library). Playback limited: You can only watch this video from certain geographic regions (like the United States or Canada), and/or you can only watch this video from a certain number of IP addresses. For videos that have extra permissions, you will also see a Permissions link on your Checkouts page (under your Account) after you borrow the video. View on browser: The publisher does (or does not) allow this video to be viewed in compatible web browsers on compatible devices. Note: Even if "view in browser" is permitted for the video you've selected, you may not be able to watch it in your browser on some devices. Certain devices, like those running Android or iOS (iPhone/iPad/iPod touch), require the OverDrive app to watch some videos. View on app: The publisher does (or does not) allow this video to be viewed in compatible versions of the OverDrive app, like OverDrive for Android or iOS (iPhone/iPad/iPod touch). View on set top: The publisher does (or does not) allow this video to be viewed using set-top devices, like a Roku or Xbox.